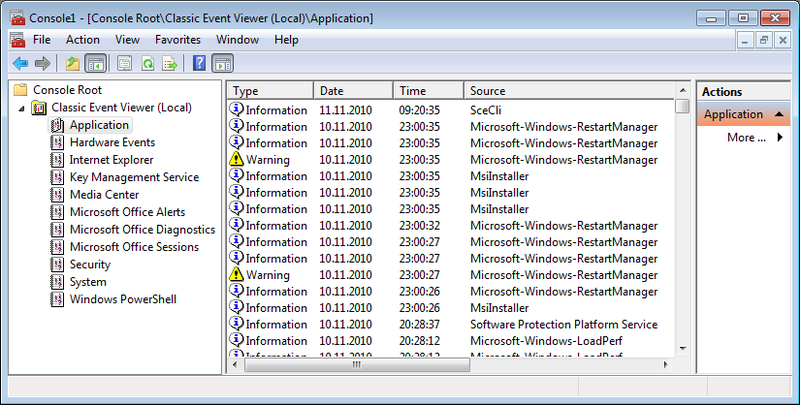 One of the first things I noticed about Windows Vista and immediatelay disliked was the new event viewer. The user interface is too cluttered, but more importantly, it is just so very sloooow. It is so slow that I think twice before starting it. And when I do, I almost feel physical pain watching it initialize. Unfortunately Windows 7 brought no improvements in this area. Just when I thought I was doomed to use this fattened-up Garfield version of an event viewer for years to come, Twitter buddy Kimmo Jernstrom described how to get back the good old “classic” event viewer on modern versions of Windows. AGREED, 100% thank you. I don’t know what ms is thinking. They have this great, high performance XP style system but default to the slow, dead dog win 7 event viewer. Someone needs to be fired asap. I have the Source column blank on two different systems, and some events do not have associated text (The description for eventid X cannot be found…) only in the “classic” console. NirSoft MyEventViewer is my preferred choice, since it works the same on any system, shows all data and is small and fast. All views of the MMC were much more responsive in Windows 2000/XP/2003, not just the event log. I’m not sure of the underlying cause. I heard it’s .NET, but that could be wrong.